Warhorse: a tale of loyalty, hope and perseverance against odds. With no boundary to call their own, no land to claim ─ animals, in wars of men nearly always fall victim to the brute brutality. The frenzy and futility of war has oft been the subject of art, Steven Spielberg’s ‘War Horse’ brings to screen an emotionally charged epic which does not shy away from making the audience look for tissue paper. 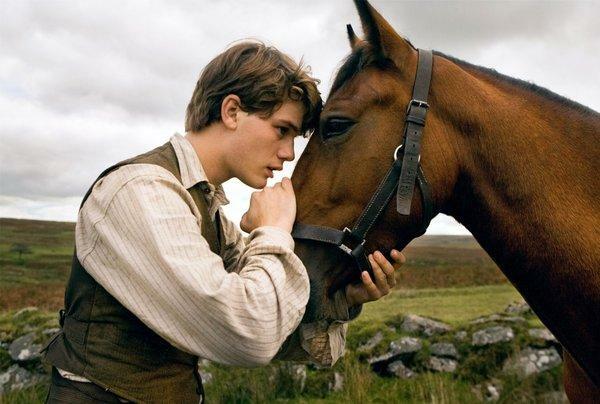 Set against the backdrop of British poverty during the timeline of World War I, War Horse, based on the bestselling novel by Michael Morpurgo and long running stage production tells the tale of a boy’s friendship with his horse; their separation during war, the hardships they endure and their miraculous reunion. Running through the motion picture is an overwhelming sense of the waste of war and its horrors. Joey, the horse gets transferred from one owner to the next, caressing the thin fine line of fate that marks death and survival. Most of the horses who somehow managed to survive World War I were sold to be butchered as horsemeat after the war. Man’s way of a deserving reward for the muted loyalty? But the true merit of this movie is not in the set pieces that are characteristically Disney, but the question that it asks you – why wage war? Reblogged this on Thy Urban Monk ~ Anand's Diary . Pingback: The Best Animal themed movies | Dog with the blog! Pingback: RIP Shaktiman ― No Country for horses, hounds & humans?